Most vinegars tend to be around 5-6% but I found a stronger distilled vinegar that says it's for pickling and it's 10%. Anyone know what the max strength that is safe for human consumption? I tasted it in some uncooked sauce last night (just a small taste) and today my throat is jacked up. My co-worker recently had strep throat so it could be that too but I'm now worried about sharing my new sauce if it's too acidic to be safe. Vinegar is acetic acid diluted with water to be a certain percentage, so if the vinegar is too strong, add more water to your recipe. In fact some people use 100% acetic acid. Ultimately, I'd say that the important part is the acidity of the sauce, not that of the vinegar. Assuming proper mixing, a small amount of high concentration vinegar will differ from a large amount of weak vinegar only in liquid content. Edited by spicefreak, 22 June 2017 - 03:59 PM. 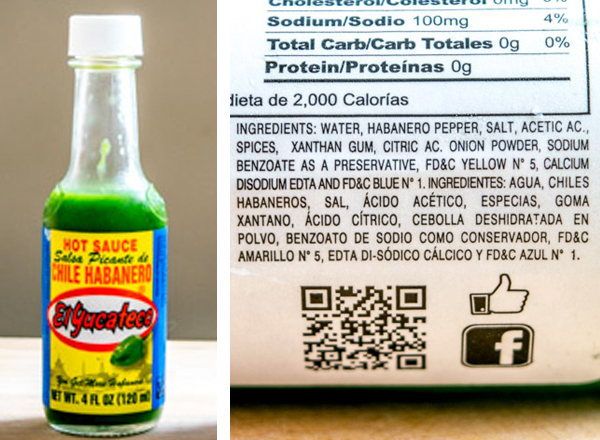 Some people use 100% acetic acid in hot sauce !?! Uh yes, you are missing the big picture as spicefreak posted... you measure the acidity of the sauce, not the individual ingredient. If you make a sauce WITH 100% lime juice, does that mean the sauce is made OF100% lime juice???? No. In fact it could be barely detectable with all the other ingredients. Tabasco uses 10% vinegar for Tabasco sauce. Your sauce is "safe" but may not be "palatable". If you drink lemonade with no sugar, it will likely have a similar effect. As others have said, it's part of the whole product. Like sauces that say "made with Carolina Reaper Chiles, the HOTTEST chiles in the WORLD!!!" Yes, Ed Currie's Carolina Reapers are the hottest chiles in the world, but if the sauce maker uses 1/2 an ounce of Reapers in 2 gallons of sauce.....that's not a lot of chiles in the whole batch and the sauce won't be that hot. most extension service recipes for pickles and such list 6 cups 5% vinegar and 3 cups water plus whatever salt and spices. A person could use 3 cups 10% vinegar and 6 cups water and the resulting brine would have the same acidity. Let's say you are getting ready to launch your BestEverSauceCompany, you have the PERFECT sauce recipe with lots of freaking awesome ingredients, and the viscosity is Perfect...so you sent it out to the FoodLab for pH testing ....AwCRAP! The pH is too low! (edit- actually, that should be the pH is TOO HIGH...or... the amount of acidity in the sauce is too low) Well, you could double the amount of 5% vinegar, but that would mess up the viscosity...or you could use 10% vinegar. Doubling the acids in the sauce without compromising the consistency. Just one example. EDIT- if the amount of acids (vinegar, lemon/lime juices) in the sauce are too low, the pH level will be too high. Adding more acidity lowers the pH. Sorry for the DPSE! Edited by salsalady, 25 June 2017 - 01:42 PM. I've been searching for that info for a long time! Curious how you came about this fact? From my understanding, Tabasco doesn't dilute at all based on videos I've watched of their production process. That's one of my favorite brands ever. I hope it's not true. How did you find out about this? From what I've seen from El Yucateco, they conducted testing themselves and released statements to their customers after the initial claims were published. Friends, as a result of the recently published UNLV study regarding lead levels in some imported hot sauces; we had each of our four habanero sauces tested by an independent lab. The results have come back and we are pleased to report, there were NO detectable lead levels found in any of our sauces tested. Thank you for your continued support of our brand. The health and safety of our consumers is and always will be our #1 priority. Please see the attached for additional information regarding lead and safety levels." I had quit eating the sauce after the initial report, but I went back to consuming it (usually at my local Mexican restaurant) after I saw the issue was being/had been addressed. I honestly don't remember where I read that. Vinegar ratio in Chocolate Moruga Sauce?